This year’s coverage of the London Design Festival kicks off with a post from our London-based editor Justine! It is truly amazing what a perfectly designed, executed and situated lens and mirror can do to transform a space! John Pawson and Swarovski Crystal Palace have created a minimalist masterpiece that really showcases the beauty of the iconic St. Paul’s Cathedral. Undeniably artistic, ‘Perspectives’ piece shows great understanding of the science of the optical experience and makes excellent use of light, space and proportion to capture and reflect the beauty of Sir Christopher Wren’s cathedral, 300 years after its completion. 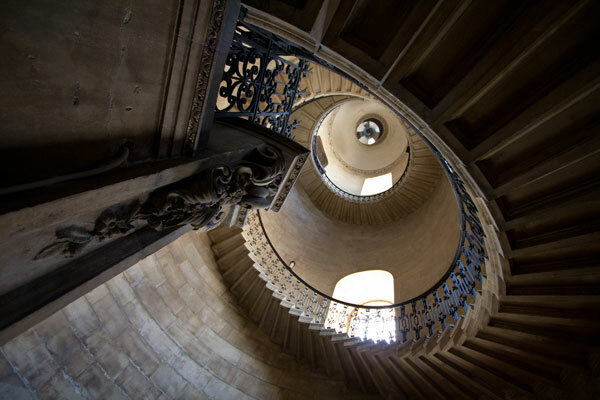 ‘Perspectives’ allows all visitors to look both up at the staggering beauty of the Geometric staircase as well as down from the top (a view accessible only to a privileged few). Pawson has accomplished this through a crystal meniscus of Swarovski crystal, situated on a reflective hemisphere. The view from above is then reflected downward from a spherical convex mirror hanging above in the tower’s cupola some 23m above. The project is a beautiful celebration of St. Paul’s and brings Swarovski’s role as a lens maker to the fore. The minimalist design of this impressive 14kg lens puts Wren’s architecture at the fore and provides a beautiful, unique perspective of this London landmark. London Design Festival is off to a great start! Check out more images of ‘Perspectives’, as well as photos of the champagne breakfast overlooking St. Paul’s on the next page! Taking a look directly up at the mirror in the cupola. Then back into the meniscus lens! And here are some photos of the lovely champagne breakfast at Madison on the roof of Jean Nouvel’s One New Change. And here are a few official closeups of the lens by Gilbert McCarragher, courtesy of Swarovski.